these burgundy tights for a little pop of color. Nice to read that you had great time on your trip! 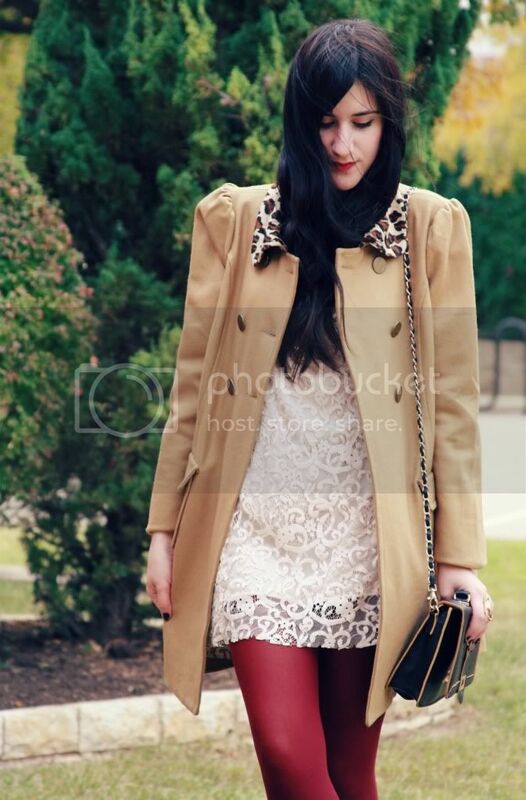 Love your laced dress and beautiful coat with leopard collar. Your blog is amazing! This outfit is gorgeous, I love the coat so much! Love the lace dress :O So pretty. That jacket is all kinds of awesome - I adore the leopard collar. I love your dress paired with those tights! Hope you have a fab Christmas! i love the lace dress! and ur coat!! Super cute coat, and I absolutely love the colour combination in this outfit! ooohh Girl!! you are so chic!! new outfit post on my blog: I'm waiting for your comment! Gorgeous outfit on you! i would totally wear it too! gotta love these burgundary leggings! Lovely! I really like the mix of colors. Oh, well, lately I love everything paired with burgundy. I like the leopard details too. That's how I like leo the most, in small dosis.Plus, I love the idea of wearing white in winter, it's one of that silly fashion rules that it's finally break. Cute. A little leopard goes a long way. love this colour on your!! truly amazing!i love the coat and its details, the dress even the red tights look so great on you!!!! 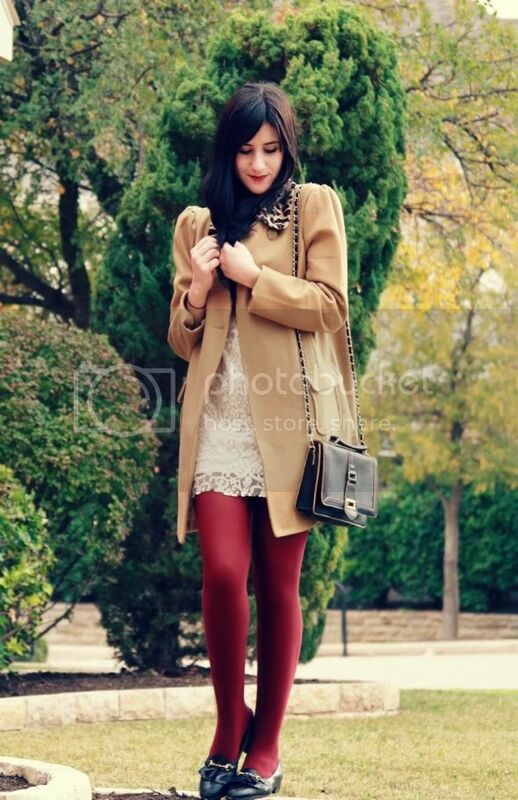 Those burgundy tights go so well with the white lace, gorgeous! Love this dress with red thight! I gotta tell you girl that you have some flawless skin. That coat is fantastic! I love it with those tights too...that color looks good with camel. Hooray - you're back! 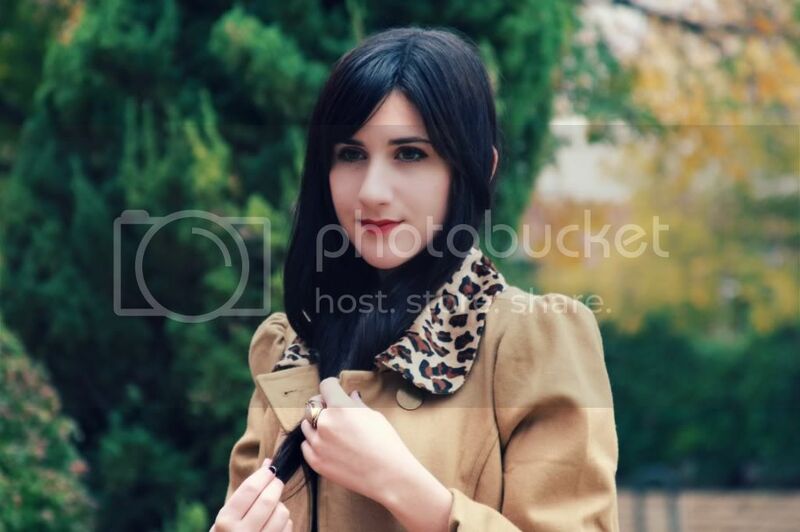 <3 I love love love the Modcloth coat! The puffed sleeves are all kinds of amazing! The leopard collar with the red is amazing! Normal I didnt like leopard prints,but on you it looks pretty good!! Your shoes are super cute! Your looks are always so perfect! You look so pretty in that dress and coat!! I love lace fabrics and even though i´m not a big fan of leopard, in small details like your coat, looks great! That H&M dress is so gorgeous! When did you get it? Long time ago? arghhhh I want it. that coat is fabulous ! You look so pretty. That collar detailing on the coat is lovely. I really like the red tights/white dress combo. The coat is amazing, I can totally see the Old Hollyood glam on it! Love how you wore two of the hottest trends; leopard and burgundy were perfect touches! Love the details of your outfit: the collar, the lace dress and cute bag! Love the collar of your coat! Is that faux fur? And it looks amazing paired with burgundy tights! You are adorable! I love that little leopard that pokes out! Your coat is perfect. I love the leopard print collar on it. It looks so nice with your pretty white dress and colorful tights. You really have the most beautiful romantic style! 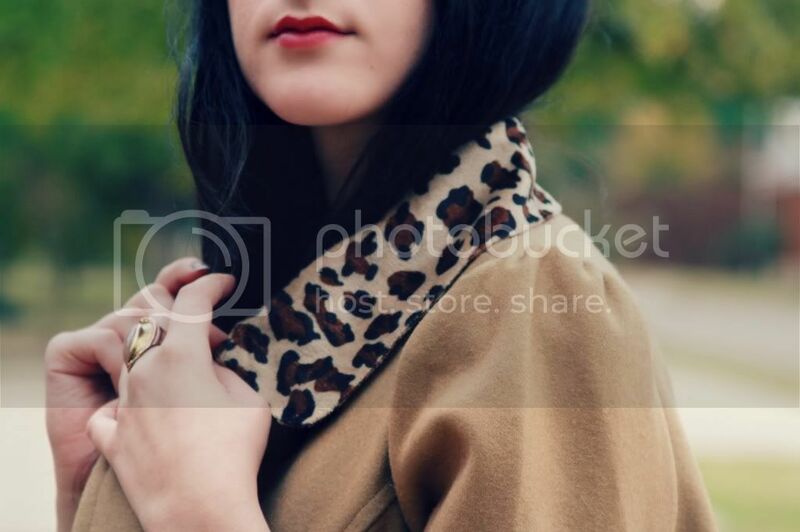 The leopard is so cute as an accent to this coat. Love it! awesome outfit!! you look great! Hi dear, and I was going through your blog, loved it. Give a pass by the mine, if you like follow me? We can follow one another. Let's keep in touch, kisses. Wauw, that coat is magnificent! awww You do have the loveliest dress selection! Amazing pairings. Lovely outfit, gorgeous dress! I love the festive tights too! definitely adore that coat. oh leopard! you look so adorable! i love your style (: Hi from NYC! 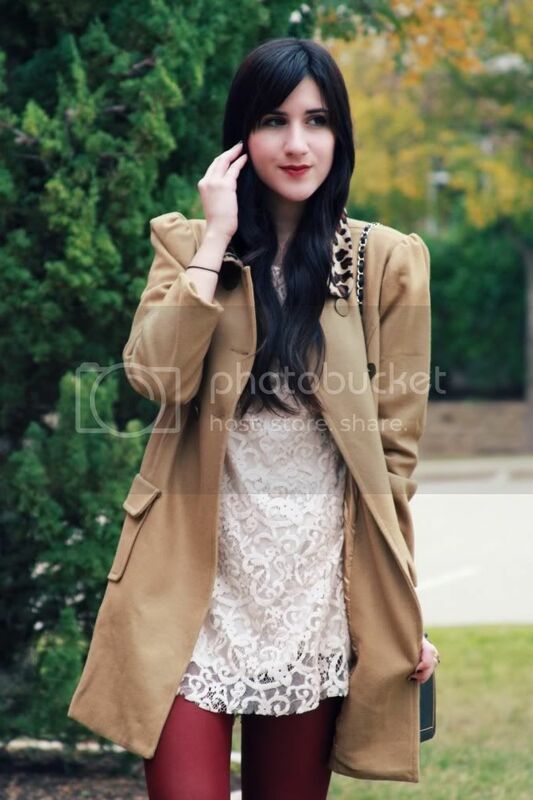 Nice lace dress, unusual combination with burgundy tights but it looks incredibly well!! This coat is pretty fabulous, and I love it with those tights! Glad you had a nice little trip! This outfit looks so good! I love the dress and colored tights, and the coat is amazing! This outfit is so classy and beautiful, Bonnie! I love how subtle the leopard print is and how you styled the coat in general. I love that shade of lipstick too. What brand and colour is it? It looks so beautiful! This is so unique Bonnie! Something totally different that can be worn with jeans or with a dress like you paired it with! You look fantastic, love how you pair red tight with the whole outfit. Your hair is perfectly beautiful. Wow, great style!! Love the burgundy tights. Want to follow each other? love the little flash of leopard! Great blog. Love the post. Love lace. Thank You, for commenting on my blog. WOW I love this outfit! You look so so stunning girl! really amazing outfit-love the bag! Lovely outfit!!!! Thank you very much for visiting my blog! I think your blog is cool! I hope we can follow each other! you look really pretty!! love the dress and the colour tights!! all the best & merry christmas! stunning jacket - the leopard collar is perfection! That collar is a great accent to your coat!